Home / 2012 / August / 2 / Wondering What Our Next Project Is? Wondering What Our Next Project Is? Ponder no more! Mend My Dress Press is pleased to announce we will be releasing Telegram: A Collection of 27 Issues, by Maranda Elizabeth, in October 2012. So excited! 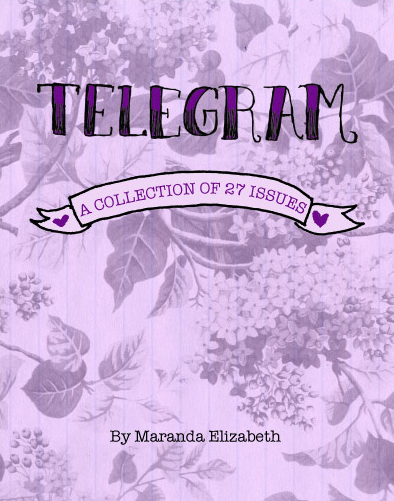 In Telegram: A Collection of Twenty-Seven Issues, Maranda tells tales of daily adventures, friendship, gender identity, falling in love with bicycles, getting tattoos, moving out, going crazy, and their experiences with inpatient hospitalizations. They also write about their relationship with their twin sister, and learning how to take care of their mental health within and without conventional institutions, identifying as genderqueer, getting sober, living a creative and meaningful daily life, and finding reasons to keep on going. At its heart and in its guts, Telegram is about seeking magic in the smallest things, staying crazy in a world that wants us to fake sanity or die, and learning how to take good care of ourselves and each other.